One of the things I like about the discontinuous-warp technique I have been playing with lately is that it gives me not one, but two opportunities to practice creating four selvedges….a two-fer. So, with the new piece that I warped this week I get two more chances, which makes five in total these last few weeks. I think my skills are improving. At the very least the process is becoming much less intimidating to me. I wonder if one day I will shrug it off and say that it is “normal” as my young teacher from Pitumarca, Peru did. 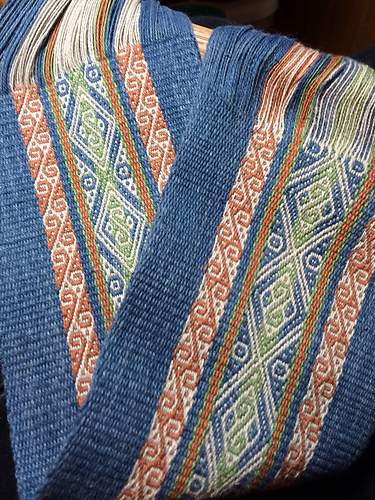 Four-selvedge bands woven by relatively new weavers…Bolivian teenagers-in-training. The first piece on which I learned the four-selvedge technique in Potosi, Bolivia. Here’s where I was at last week when I wrote my blog post. I still had the heddles in place and and had just removed the shed rod from the left hand side. And here is the piece with the gaps closed. There are a few wobbles here and there but I am pretty pleased with it. Next came the tubular edging band and it took me five attempts to settle on the pattern and size. Part of the problem is that I don’t have much of a wool stash and the colors are very limited so, in the end I had to go with a heavier tubular band than I would have liked. 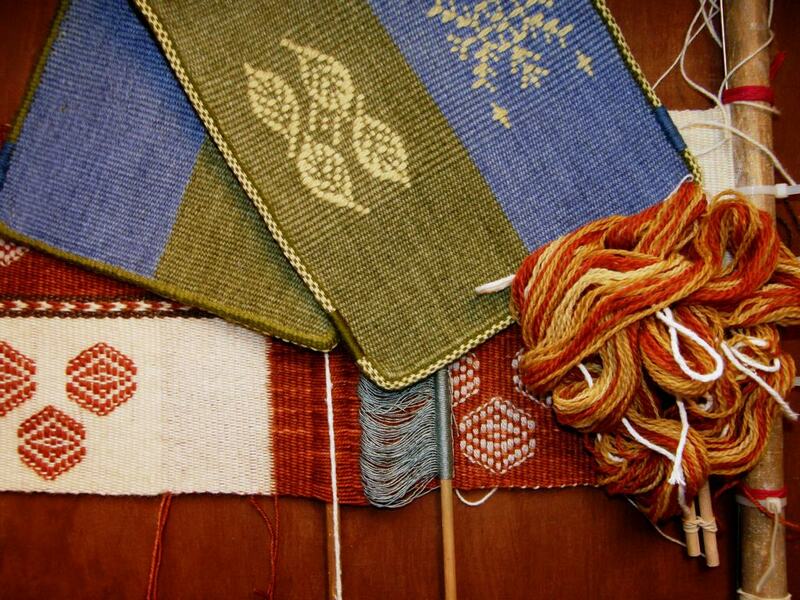 Late night weaving and sewing with poor lighting…not a good idea! I had to unpick a fair bit next day. You can just see near the upper left corner the end of the tubular band. I was left with the problem of what to do with all those warps ends. They are easier to deal with when you sew a tubular band to a bag. The band can be continued down into the bag, its end sewn over and hidden away inside. 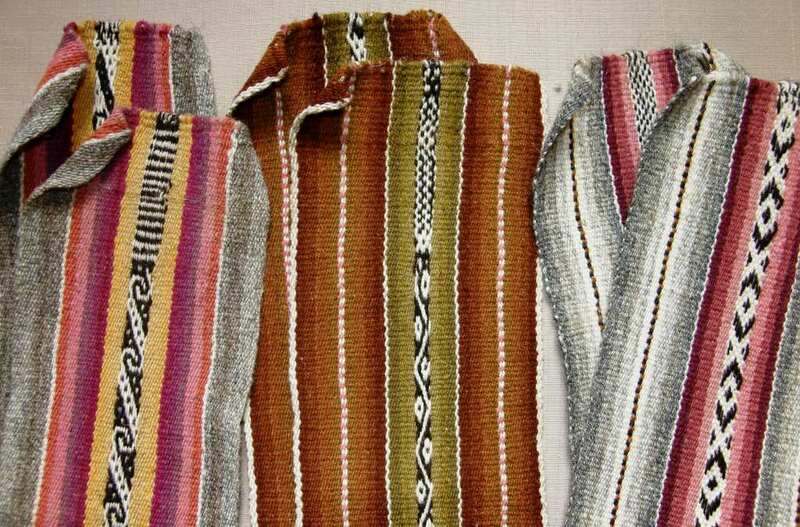 When you look at an Andean textile that has been finished this way, you have to look hard to find the start and finish of the tubular edging. On all the pieces I have seen, the end has been sewn over and over and the unwoven warps cut. It has been done so neatly that you can barely tell that the resulting blunt end is there. This is something on which I need to work! So, I wrapped the place where the start and finish of my band collided. It was obvious and ugly and I wanted to hide it. The small bit of wrapping looked pretty awful. My solution was then to extend the wrapping to about an inch and wrap all four corners the same way. This would transform the wrapping into what we weavers like to call, with tongue in cheek, a ”design element”. You can see two of the wrapped parts below. 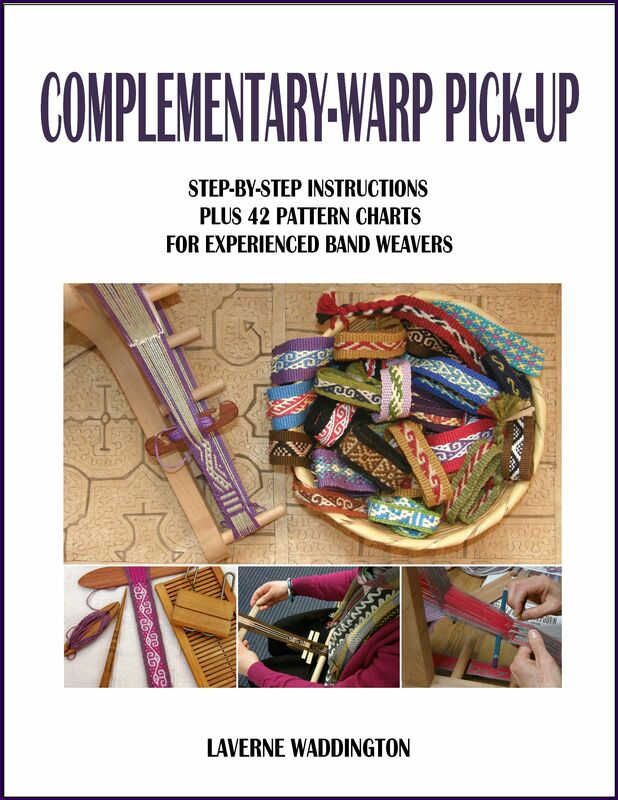 I created a threaded-in pattern for the tubular band rather than do something with pick-up. I warped the pattern off center so you can see the whole design sitting next to the upper face of the cloth rather than having to tip the edge to view it. The band on the back side of the cloth is in a solid color. Underneath all that you can see this week’s new discontinuous-warp project…another two-fer. It looks like I will be able to use that discarded tubular band warp from last week after all. I think the colors match this new project well. What am I going to do with these pieces? Nothing! They are samples, practice pieces, notes and lessons in cloth. 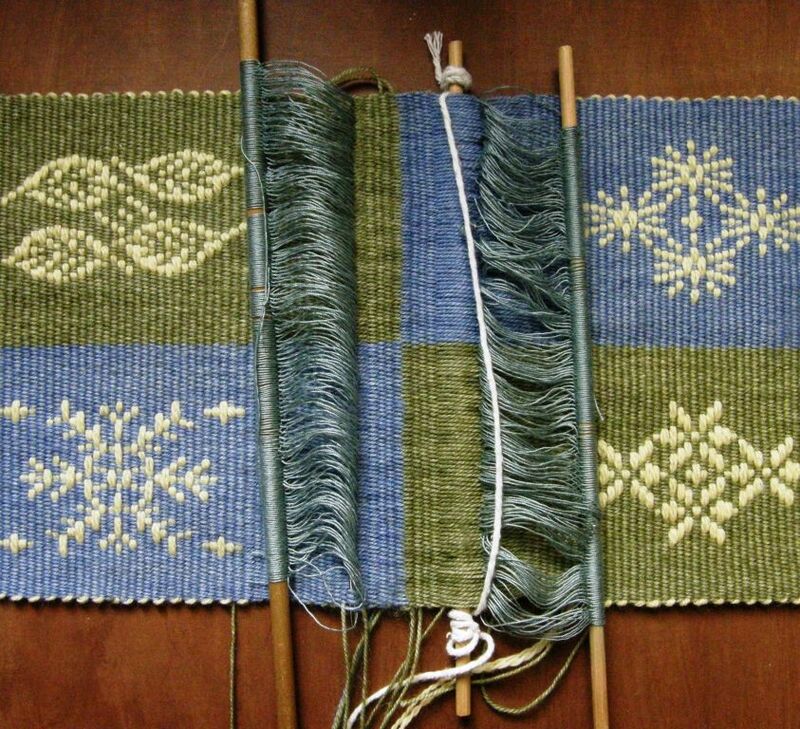 I would like to have one of the pieces in my wall hanging series represent the ticlla, or discontinuous warp technique, and so, the pieces I am currently weaving are part of my warm-up for that. I so love sitting in front of a fresh warp like this!…terracotta and natural discontinuous warp in the same Navajo wool warp yarn that I used for the Four Seasons piece. This time I warped for a tiny strip of simple pick-up down the center and re-spun some brown wool to match the twist of the Navajo warp to use as the border color. I wanted to use a complementary-warp technique. I wanted to decorate this one with supplementary-weft patterns again but I chose a “discontinuous” method this time in that the weft does not travel all the way across the warp to turn at the edge. 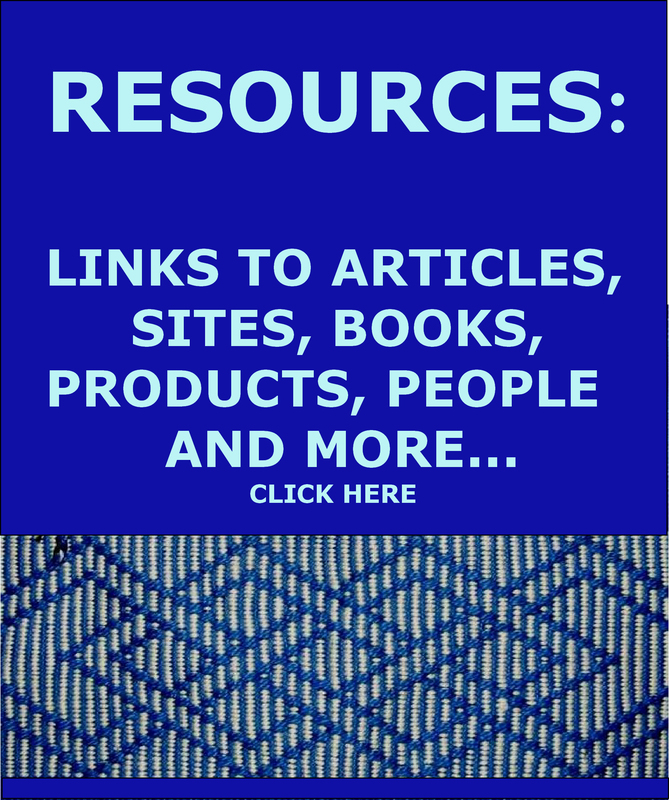 The weft-turns shadow, or outlines, the motif. The terracotta supplementary-weft yarn that I used could have been thicker. I didn’t get as good coverage with it as I did with the lighter color. 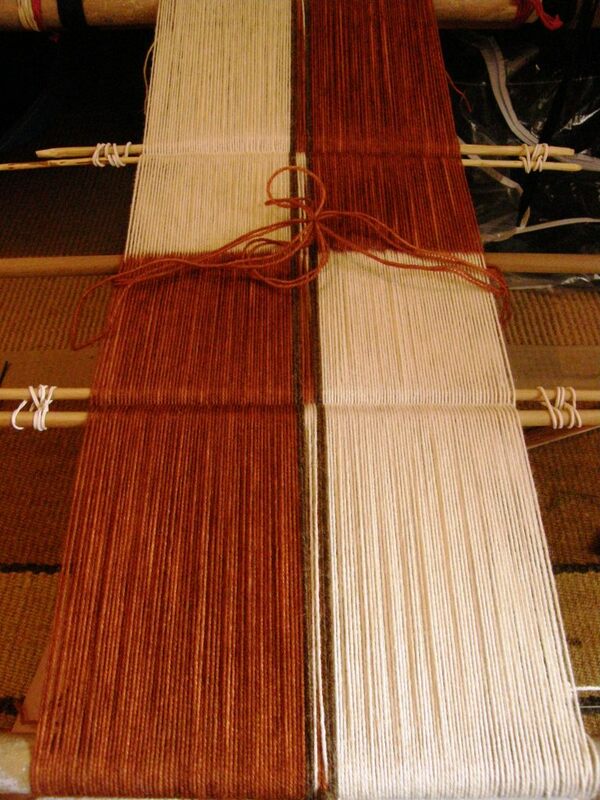 The light bumps at the edge of the terracotta half of the cloth are the main weft turns. 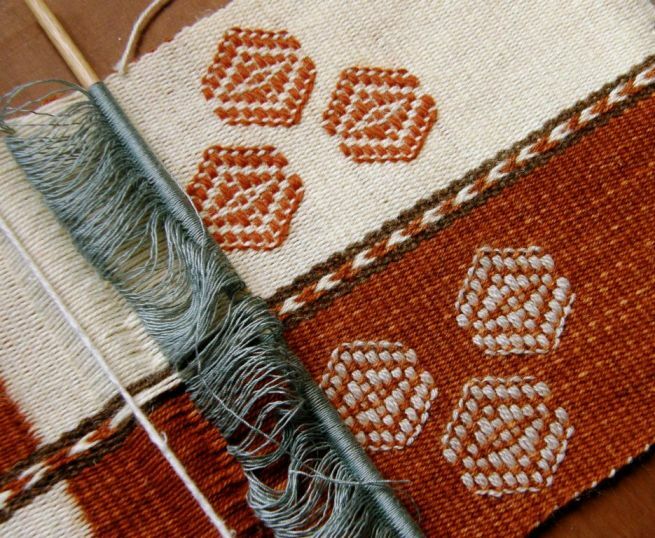 I had to go back and forth between white and terracotta weft as I didn’t have enough of either alone to complete the project. Those contrast color weft-turns will get covered by the tubular band later. The turns of the supplementary weft lie beside the motifs in a nice outline. I wove the pick-up pattern wondering if there was a way I could close the gap between the two woven ends without interrupting the pattern. It was a four-shed pattern and I hoped that I would be able to fix things so that I would be in just the right shed for the last weft pass. I think a lot of it came down to luck in the end. The weaving fairies were with me :-). It worked! Now, let’s see if I can manage it on the other side. Hey, weaving fairies, don’t go away yet. I am disappointed with how noticeable the change from white to terracotta weft is in the white section…oh well. 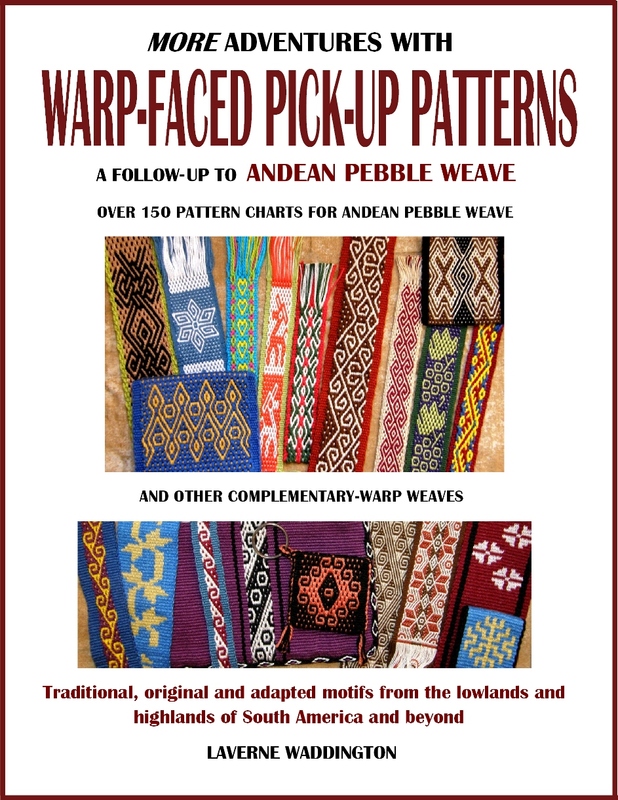 I am very happy with my wee bit of pick-up on this piece but, before I get too carried away, here’s a reminder of what the Pitumarca weavers achieve as far as pick-up is concerned…. Granted it is a little easier to weave supplementary-warp pick-up in the small space at the finish of a four-selvedge piece but, oh my gosh, look at that! 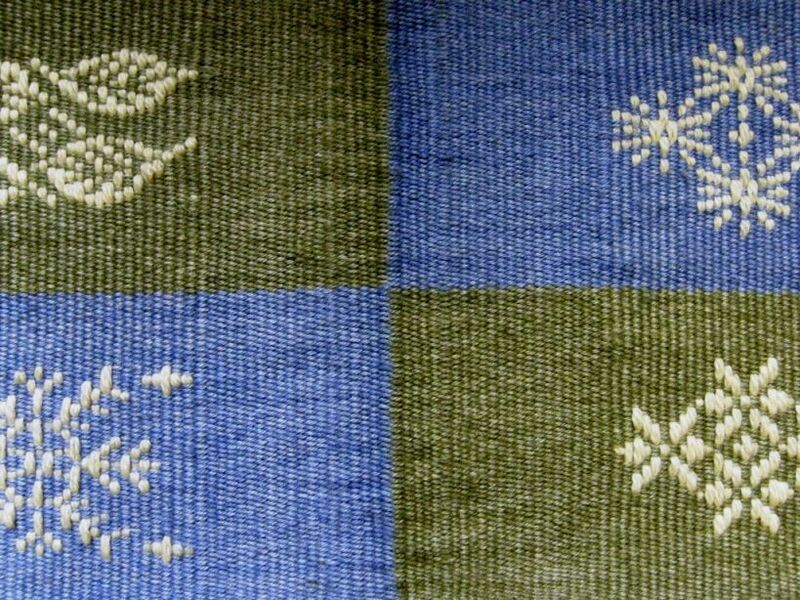 I would say, and this is just my guess, that the weaver closed the gap at the outer edges where you can see the tiniest fraction of an inch that is without pattern. The natural alpaca colors are so gorgeous. I don’t remember where the start and finish of the tubular band is located on this piece but your eye is certainly not drawn to any obvious spot where the weaver may have finished. Above you can see a weaver from Pitumarca, Peru nearing the end of the warp. You can see how small the space in which she picks up the patterns and operates the heddles is. One the right you can see how a four-selvedge piece with supplementary- warp patterns (part of a discontinuous-warp piece) has been finished. While waiting for the brown yarn to dry and have its twist set, I thought about other possible ways to hide the join in tubular bands on these flat woven pieces. Maybe some cross knit looping? 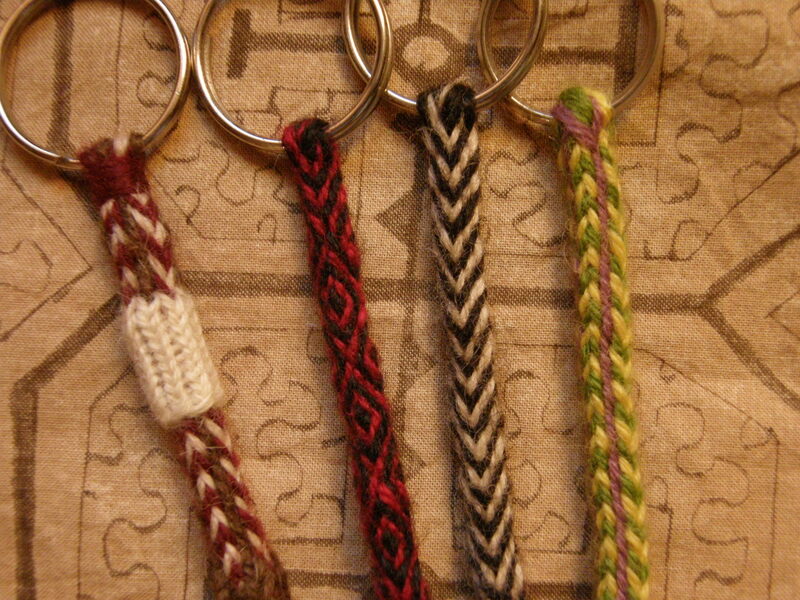 I practiced on one of the braided keyfobs that I have been making, the first one which was bit on the loose side. It could be sacrificed for this experiment. I am not convinced but I will keep it up my sleeve just in case. I think it looks cute, as if I had knitted a wee wool sweater for the braid! I added another Margarita braid to the collection in red and black. 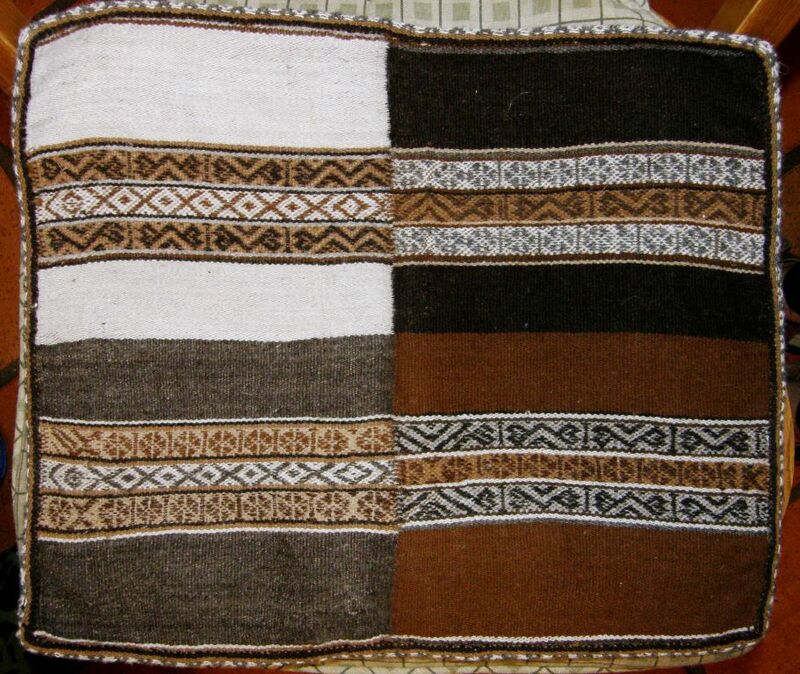 Jennifer finished her stunning hemp piece with pick-up patterns of Chinchero, Peru. I have charted these in my second book. 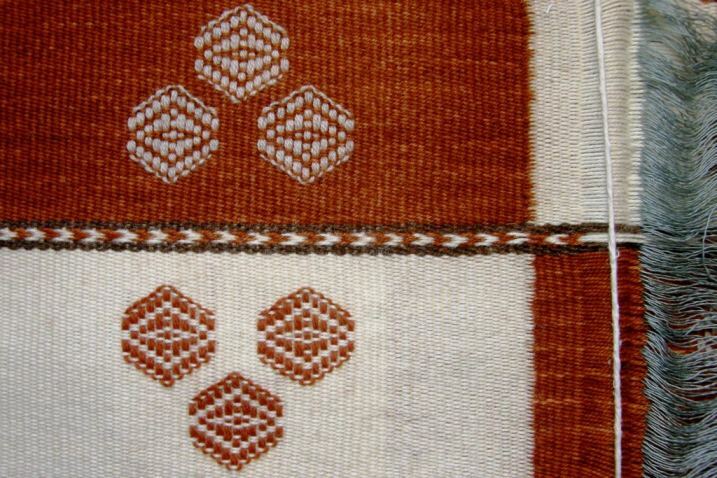 I like to think of complementary-warp structures as two-fers…one weft shot produces pattern on two beautiful faces. Now she has to choose which face with be the outside of the bag she is planning. I am afraid that none of us in the Ravelry group were helpful when she asked us for opinions. We all liked both sides equally, of course! 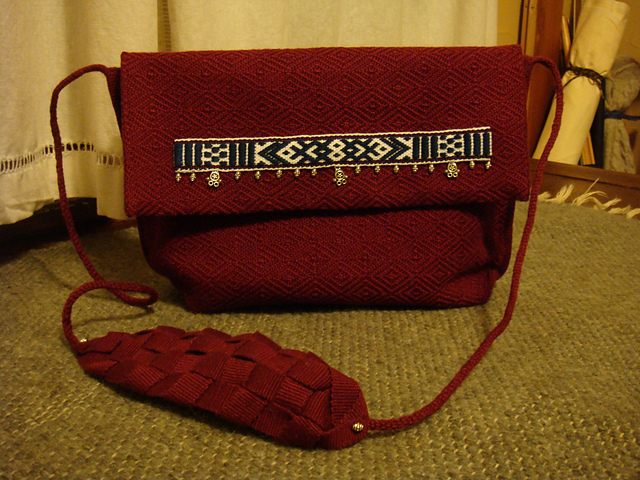 And speaking of bags, Julia once again wowed us with her weaving, piecing together and sewing skills….her creativity! 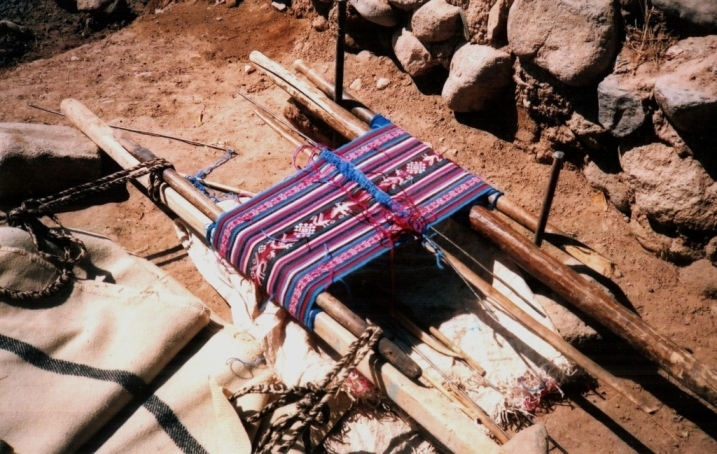 The main fabric was woven on her floor loom and is stunning in itself. CindyQ, also in the Ravelry group, wove the blue supplementary-warp pick-up band and had given it to Julia as a gift. Julia’s idea for making a shoulder pad for the slim tubular band strap is so clever. She wove the band for the strap in tubular form and then wove it as a flat band for a while. She braided the flat band to form the shoulder pad. How cool is that? 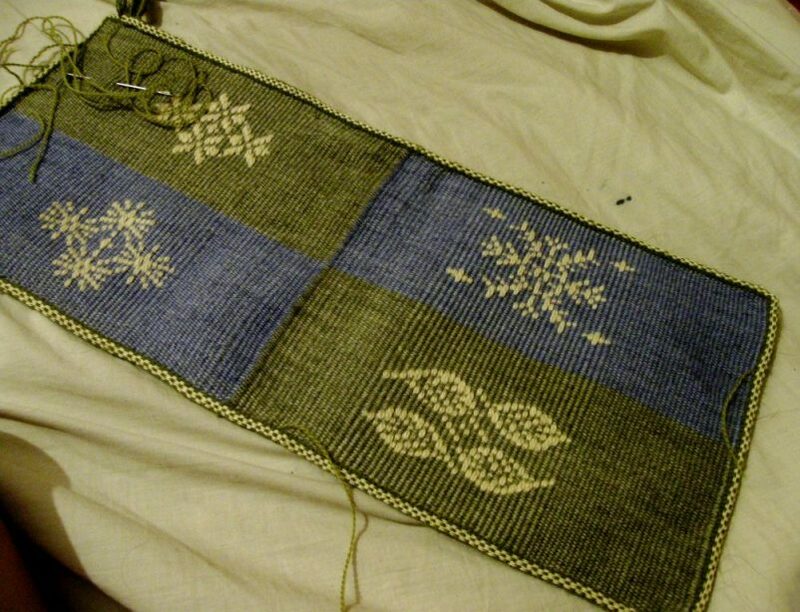 Kim Varland, yet another Ravelry weaving buddy, has been playing with the yurt band border pattern that I have charted and explained in one of my tutorials. I love her color combination and she shows more examples on her blog. Kim has used what I call a simple warp-float technique. 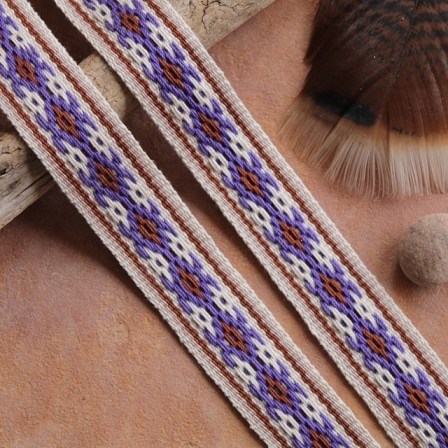 While the pattern on the back side of the band is attractive and interesting, it is not truly double-faced. 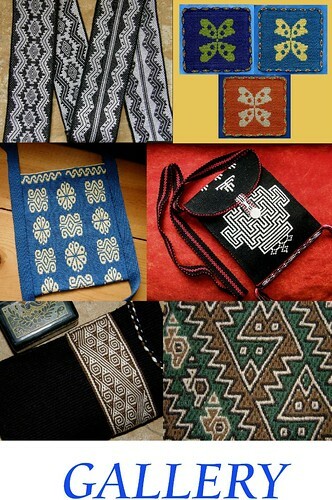 I have shown these patterns to weavers who all love the way it looks on the back. The other day I was explaining to one of our new Ravelry group members what was meant by a “complementary-warp structure”. I was thinking that surely I had put a description of this somewhere on my blog with lots of pictures. 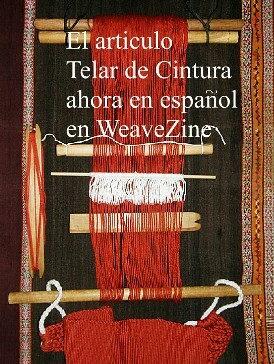 I found it in a post back in 2011 which I had written just before going to Cochabamba to weave with my teacher Maxima. 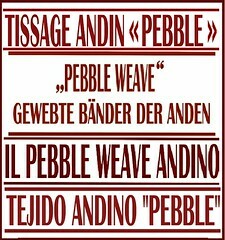 I had promised to start a tutorial page on my return which explained some of these terms which are used for some of the common structures woven by backstrap weavers here in South America. It turns out that I never did and so , I will copy that portion of the blog post to a new page and will add some other structures to it this week….only two and a half years overdue! Above you can see the double-faced, or two-fer nature of complementary-warp structures. Your work is stunning. Can you tell us where you obtained the Navajo warp? Did you dye the terracotta color? I have a wee bit of Navajo warp from a project from 40 years ago and haven’t found it again. Guess I don’t know where to look. Also, you said something about using Knitpicks Palette for this piece (I think). Did you respin it or did it work OK as is. Thanks for your comments. I got the warp at the Mannings but it was the last of some very old stock. Friends dyed it green, blue and terracotta for me. One of the ties on the terracotta was too tight and that is why it has that streaked look. I didn’t re-spin the Knitpicks Palette. I just happened to have that in my closet and decided to see how it would handle. It would not be my first choice if I wanted to weave again with wool as I am sure that there are higher twist yarns that would be easier to use. The Palette wove up well but I had to handle it with care on the backstrap loom. Maybe Weaving Southwest in NM carries Navajo warp. You might find Navajo warp at http://www.fiberfactory.com a shop in Mesa, AZ that teaches Navajo weaving. Thanks, Jennifer. Wool on wool is a nice place to start with supplementary-weft patterning. Thans, Ingrid.You are right. It does look like a braid. It is such a simple pattern and perfect to practice a little bit of pick-up within four selvedges.